Neutrophils are produced in the bone marrow from the hematopoietic stem cell under the influence of neutrophilopoietic cytokines, such as granulocyte- (G-CSF) and granulocyte-monocyte stimulating factor (GM-CSF). 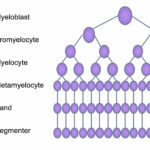 These cytokines are produced by marrow stromal cells, including T lymphocytes (GM-CSF). Neutrophils are produced daily and normally have a circulating lifespan of <24 hours in humans (Lahoz-Beneytez et al 2016). In horses, a study with radioactively labeled chromium showed that the neutrophil lifespan was 10-11 hours (Carakostas et al 1981). Within the bone marrow, neutrophils are produced from hematopoietic stem cells, which form myeloblasts (common myeloid progenitor). Myeloblasts differentiate into progranulocytes (common progenitor for all granulocytes, i.e. neutrophils, eosinophils and basophils). The earliest identifiable neutrophil-specific precursor is the neutrophilic myelocyte, which is more mature than the progranulocyte. Neutrophilic myelocytes can be differentiated from eosinophilic and basophilic myelocytes because they have faint pink barely discernible granules (in dogs in particular) compared to eosinophilic and basophilic granules in the latter precursors, respectively. The myelocyte differentiates into a metamyelocyte then into a band neutrophil and finally a mature segmented cell. These stages are differentiated by the shape of the nucleus (round in the myelocyte, kidney bean-shaped in the metamyelocyte and horse-shoe shaped in the band neutrophil) as well as the location of the nucleus in the cell (more eccentric in myelocytes and metamyelocytes to central in segmented neutrophils). As the cells mature, they lose mitotic capability and and have less protein synthetic machinery (rough endoplasmic retention). Retention of protein synthetic machinery (rough endoplasmic reticulum) in mature neutrophils indicates immaturity and is a feature of “toxic change“, which is cytokine-driven accelerated maturation and release of maturing neutrophils in response to an inflammatory stimulus. Neutrophil precursors can be divided into the mitotic pool (myeloblast, progranulocyte, myelocyte) and post-mitotic pool (metamyelocyte, band and segmented neutrophils). Transit from the mitotic pool and maturation through the sequential stages takes about 4-6 days in humans (Lahoz-Beneytez et al 2016). In addition, granulocytes are located in the paratrabecular or osteoblastic niche in the bone marrow (closest to bone marrow spicules), a unique microenvironment in which important stromal si.gnals (mechanical and chemical) promote myeloid maturation. This niche is furthest away from the bone marrow sinusoids, however neutrophils have adhesion molecules and can move away from the osteoblastic niche into the sinusoids and then into the peripheral circulation. Neutrophils are retained in bone marrow due to high marrow concentrations of stromal-derived stem cell factor (SDF-1α), which is recognized by the chemokine receptor, CXCR4. The receptor is expressed in low concentrations in mature neutrophils in murine bone marrow and inhibition of this receptor causes a release of neutrophils into the circulation (Furze and Rankin et al 2008). Under inflammatory conditions, neutrophils are released from the bone marrow in response to inflammatory cytokines, such as macrophage inflammatory protein-2, interleukin-8, and chemotactic leukotrienes (e.g. complement C5a). In addition, the granulopoietic cytokine, G-CSF, reduces SDF-1α levels in marrow and decreases expression of the receptor, CXCR4, on mature neutrophils (the SDF-1α-CXCR4 axis serves to retain neutrophils in the marrow compartment), and stimulates selective neutrophil egress from marrow as well as increased production. In order to enter the circulation, neutrophils have to traverse the bone marrow sinusoidal endothelium, a layer of specialized endothelial cells that act as the only barrier between peripheral blood and marrow. This is accomplished by neutrophils transmigrating across the endothelium, which does not adversely affect the endothelium (Furze and Rankin 2008). Endothelial cell injury could potentially result in the non-specific release of neutrophils and may explain leukoerythroblastic responses (leukocytosis with a left shift in neutrophils and increased nucleated red blood cells) in blood in certain disease states (e.g. severe trauma, septicemia, bone marrow neoplasms). As neutrophils age, they exit the circulation (and actually become more effective antibacterial agents) and undergo programmed cell death (this normally occurs in the bone marrow, liver and spleen but also sites of egress into tissues). Homing of senescent neutrophils to the bone marrow is mediated through the SDF-1α-CXCR4 axis, with higher expression of CXCR4 on older neutrophils (Martin et al 2003). Factors that affect this natural turnover can result in prolonged neutrophil lifespan and persistence in circulation or decreased lifespan and neutropenia (e.g. congenital neutropenias). Lifespan in blood and tissues can be prolonged under inflammation, under the influence of inflammatory cytokines such as IL-1 and IL-17A, and signals from micro-organisms. Studies in mice have also shown that the normal gut microbiotica (particularly Lactobacillus species) can inhibit neutrophil apoptosis, prolonging lifespan, through their peptidoglycans stimulating pro-inflammatory cytokine secretion (IL-17A) from γδ intestinal T lymphocytes (Ergott et al 2016). Although neutrophils are considered a homogenous population of cells with similar function and activity, neutrophils in blood (of mice at any rate) are of different ages, with older and younger (more newly produced) cells. Studies with mice show that “aged” neutrophils (as shown by lack of uptake of the proliferation marker, BrdU after pulse exposure and higher CXCR4 expression) express higher levels of the adhesion molecule, Mac-1/CD11b, particularly after stimulation by lipopolysaccharide. Higher expression of Mac-1 appears to mediate the more rapid recruitment of older neutrophils to sites of inflammation, in a TLR-4-dependent mechanism, meaning that these neutrophils are the first defenders against micro-organisms. They also appear to display higher phagocytic activity, but similar levels of bacterial-killing reactive oxygen species, to newer neutrophils (Ulh et al 2016).